Everyone needs a certain amount of sleep to maintain health, but growing children need more sleep than adults. The amount of time children should sleep is loosely based on age but also on a child's individual needs. By the time a child is 17 months old, he should be able to fall asleep independently and remain asleep all night. Child-care professionals use a range of hours for the amount of time a toddler should sleep. The range can help parents determine if their child has sleep problems. 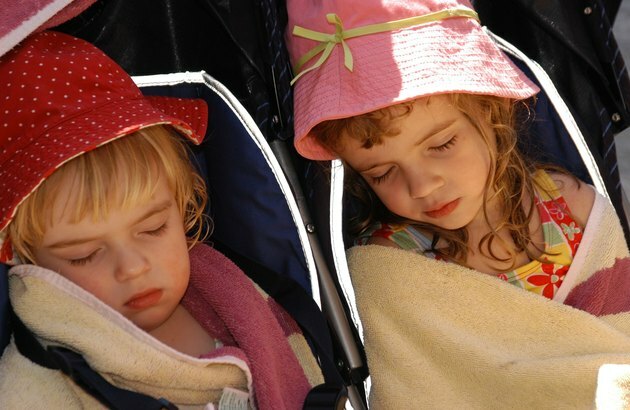 Children develop natural sleep cycles, which are regulated by light and dark, by the time they are 6 months old. Most children between the ages of 1 and 3 sleep for 10 to 13 hours, according to KidsHealth.org. Your 17-month-old toddler may have begun to nap less. Instead of several naps each day, he may only have one nap for one to three hours a day. Children who do not get enough sleep often have more difficulty falling asleep. Sometimes toddlers are simply uncooperative. Separation anxiety can cause them to fight going to sleep. Your toddler might be afraid to sleep if she has dreams or nightmares, and teething and other physical discomforts can rob a child of sleep. Children have trouble falling asleep if their environment is not quiet, comfortable and safe. Your child's sleeplessness also might be caused by a medical condition, such as sleep apnea. When your toddler does not get enough sleep, he may be tired, cranky and have trouble concentrating. Children who do not get enough sleep may become sleep-deprived, a condition that can cause serious physical and mental health problems. A sleep-deprived child might exhibit anxiety or depression. Sleep deprivation can lead to obesity and attention deficit disorder. Lack of sleep can increase a child's risk for developing diabetes and compromise your toddler's immunity. Children need time to wind down and get ready for sleep. Schedule about 15 minutes of quiet time before bedtime and use that time to read a book or talk. Allow your toddler to create her own simple before-bedtime routine to practice each night. Stick to the same times for naps and bedtime so that your 17-month-old becomes accustomed to the schedule. Avoid scheduling naps too close to bedtime. If your toddler does not want a nap, allow her to have quiet time instead. Talk to your pediatrician if you suspect a medical problem or if your toddler continues to have sleep problems. Also alert your pediatrician if your toddler is sleeping too much.